Home / Question/Answer / DID ANY EARTHQUAKE TAKE PLACE AT THE TIME OF PROPHET MUHAMMAD (PBUH)? 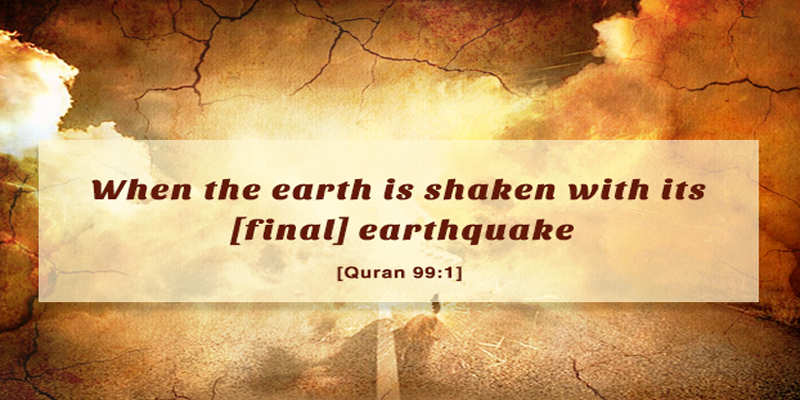 DID ANY EARTHQUAKE TAKE PLACE AT THE TIME OF PROPHET MUHAMMAD (PBUH)? It was narrated that Muhammad ibn ‘Abd al-Malik ibn Marwaan said: The ground shook at the time of the Messenger of Allah (blessings and peace of Allah be upon him) and he put his hand on it then he said: “Be still, for it is not yet time for that.” Then he turned to face his Companions and said: “Your Lord is asking you to seek forgiveness, so seek forgiveness.” Narrated by Ibn Abi’l-Dunya in al-‘Uqoobaat (no. 18). : ‘Abd-Allah told us, ‘Ali ibn Muhammad ibn Ibraaheem told me, Abu Maryam informed us, al-‘Attaar ibn Khaalid al-Harami informed us, Muhammad ibn ‘Abd al-Malik ibn Marwaan told me. It is a mu‘dal mursal report. Muhammad ibn ‘Abd al-Malik ibn Marwaan died in 266 AH, so how he could tell of something that happened at the time of the Prophet (blessings and peace of Allah be upon him) which no one else narrated? al-‘Attaar ibn Khaalid al-Harami - I did not find any biography of him. Narrated by Ibn Abi Shaybah in al-Musannaf (2/357). He said: Hafs told us, from Layth, from Shahr. It is mursal. Shahr ibn Hawshab died in 112 AH, and did not witness the time of the Prophet (blessings and peace of Allah be upon him). Moreover he (Shahr ibn Hawshab) is da‘eef (weak) in and of himself, according to some scholars. Shu‘bah said: I do not pay any attention to his reports. Al-Nasaa’i said: He is not strong. Ibn Hibbaan said: He is one of those who narrated from trustworthy narrators problematic reports. al-Bayhaqi said: He is da‘eef. Others regarded him as trustworthy. Hence al-Haafiz Ibn Hajar said concerning him: He is sadooq but he narrates many mursal reports and is confused. Layth ibn Abi Sulaym - he is confused a great deal and we cannot be certain about his hadeeth, so he was rejected. Hence al-Haafiz Ibn Hajar said in al-Talkhees al-Habeer (2/222): This is mursal da‘eef. This report was also narrated from Ibn Mas‘ood (may Allah be pleased with him), as reported in Tafseer al-Tabari (17/478): Bishr narrated to us, Yazeed narrated to us, Sa‘eed narrated to us, from Qataadah, that he said: “And We sent not the signs except to warn, and to make them afraid (of destruction)” [al-Isra’17:59]. Allah causes people to fear Him by whatever signs He wills, so that they might learn a lesson or be reminded or come back (to Him). It was said to us that the ground shook in Kufah at the time of Ibn Mas‘ood, and he said: O people, your Lord is asking you to seek forgiveness, so seek forgiveness. To sum up, there is no proof that an earthquake took place at the time of the Prophet (blessings and peace of Allah be upon him); rather it happened after his time, at the time of ‘Umar ibn al-Khattaab (may Allah be pleased with him). That was narrated by Ibn Abi Shaybah in al-Musannaf (2/358) and by others from Naafi‘ from Safiyyah who said: The earth shook at the time of ‘Umar, and he addressed the people and said: “If it happens again, I shall definitely abandon you and leave.” That was mentioned by Ibn al-Jawzi in al-Muntazam, among the events of the year 20 AH.